Web Wednesday : ad:tech Beijing is upon us! 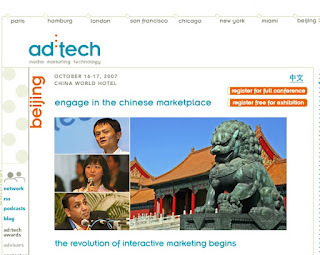 This year ad-tech comes to Beijing. In it's third year, the conference will attract a wide range of foreign firms wanting to enter China's blossoming and highly-competitive online advertising industry. The event will be held at the China World Hotel on 16th and 17th October. The conference attracts a list of the top national and international speakers but scares away many local delegates due to it's overpriced entry fee (US$595-895). Many will opt to either wander around the booths of the 27 exhibitors (at no charge) or to take up the last minute email offer to sign up for free access to listen to the six key note speaches, given by dignitaries from Tencent, Sohu, Netease, Yahoo! China, Sina, PepsiCo, Northwestern University, OgilvyOne, Friendster, Softbank China and India, China Market Research Group and EF.com. HDTWorld, a leading local online ad network, will also be carrying out some ambush marketing and have set up the 3rd Rich Media Industry Forum to be held on 17th October in the same hotel. For those who want to get real grass-roots insight into the local internet industry in China then I'd also suggest attending a rival / additional event - Web 2.0 and Internet Investment Annual Conference - run by iResearch, who spend their days researching and reporting on Chinese internet usage. This event is sure to give a deeper understanding of the wonderous workings of Chinese web 2.0 companies and the goals of their backers.